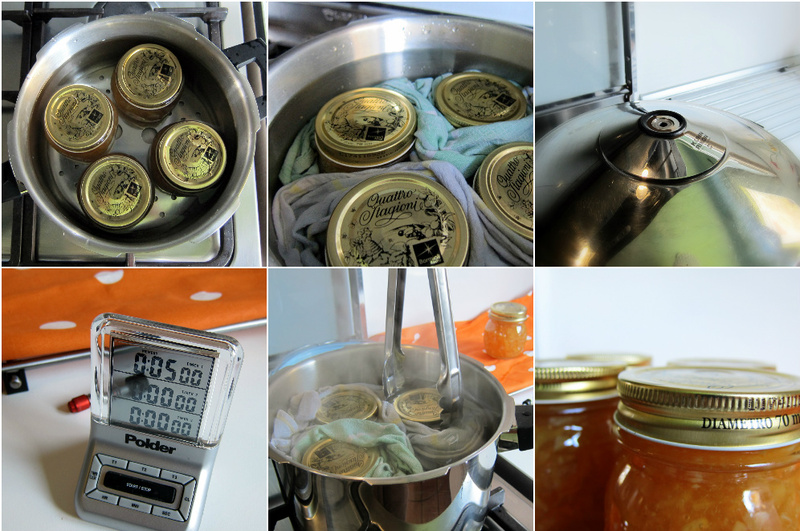 A pressure cooker and mandolin work together to make a delicious marmalade in under an hour. If you find yourself with abundant fruit and not a lot of time – this fantastic sweet, tart and zesty recipe is for you! Once you make the marmalade in your pressure cooker, you can stop there, and put it in your refrigerator in a pretty little jars that will last a few months. Or, if you have canning jars, you can “process” it – hermetically sealing the jars by boiling them for a short amount of time so that they can go in your pantry and last indefinitely. How super-fast? This technique does not require you to soak, peel, de-pith, finely shred or filter the pulp. All you need to do is quickly slice the lemons using mandolin, remove the seeds as you find them, cut a stack of slices into 4 pieces, pressure cook to soften with a tad of water, and then add sugar and simmer for a few minutes. I made this marmalade with lemons, but you could use any citrus (see the bottom of the recipes for variations). Adjust the sugar accordingly depending on the acidity of the fruit. Super-sweet oranges and mandarins will only need 1x the sugar while grapefruit, lemons and Seville oranges (known for their bitterness) will require twice. If you can’t decide or want to make a low-sugar version, just sneak a taste after the sugar is melted and simmered and see if you like the results. This recipe can be adjusted for the amount of lemons you have, since the sugar is decided on the weight of the lemon rinds and pulp. I have even made this recipe with just two lemons in my small 2.5L pressure pan cooker! Slice lemons using the "thin" setting on mandolin, discard ends or slices that are all pith. Stack slices, removing seeds as you go (save them for later) and cut into four. Put your pressure cooker on scale, hit "tar" or zero and then add thinly sliced lemon wedges and any juice that may have squirted out in the process. Write down the weight of the fruit (for me is was 786 grams). Add the minimum amount of liquid your pressure cooker needs to reach pressure, about 1-2 cups, and close and lock the lid. NEVER FILL THE COOKER MORE THAN HALF-WAY with fruit and liquid (this includes the sugar). Turn the heat up to high and when the pressure cooker reaches pressure, turn it down and begin counting 10 minutes cooking time at HIGH pressure. When time is up, open the pressure cooker using the Natural Release method - move the cooker to a cold burner and don't do anything and wait for the pressure to come down naturally. For electric pressure cookers, up be sure to turn off the "keep warm" mode, if it automatically engages in your model. Calculate how much sugar to add - typically an extra-bitter marmalade needs twice the sugar. That looks like ALOT of sugar if you've never made fruit preserves! So if you are concerned, try the same weight in sugar first, then taste a cooled sample on a teaspoon and see if you like it. 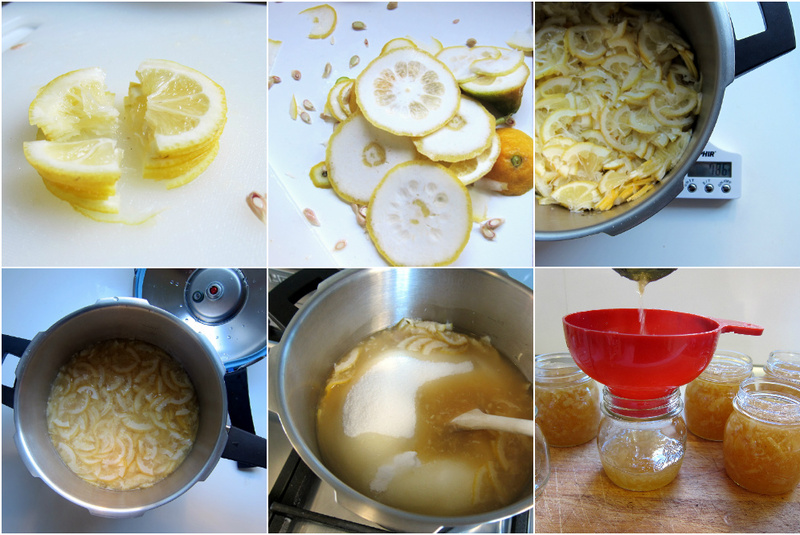 For my marmalade I doubled the weight of the tirmmed lemons with the sugar (1500 grams). When you open the pressure cooker the fruit pulp will already be warm, so pour all of the sugar in and stir. It should all melt within a minute or two. Then, add the tea ball containing the seeds. Now, turn the heat up and bring everything to a rolling boil for 5 minutes or, if you have a thermometer, you will want the mixture to reach 212F or 100C. Now, using a ladle or canning funnel, distribute the contents evenly in your freshly dish-washed or sterilized jars. Carefully wipe the edges of the jars and screw on the lids until they are lightly closed (do not tighten). Quickly wash out the base of the pressure cooker, and add the rack or steamer basket (without trivet). Place the jars so that they don't touch each other or the sides of the pressure cooker (I could only fit four, so I had to do two batches). Next, arrange the kitchen towels so that the jars do not move and clink around while boiling (I put them in an S around two jars in opposing directions). Now, fill the pressure cooker with enough water to cover by an 1" or so. If you have hard mineral water that usually leaves spots on your glassware, add a tablespoon of vinegar in the water to keep your jars shiny and beautiful. Set your pressure cooker to "no pressure" or "exhaust" position. If you have neither of those, like mine, just remove the valve, or weight, completely from the housing - as you would when cleaning it. Close and lock the lid and put on high heat until you start seeing an even stream of vapor coming out of the valve - you can even open the lid to check and make sure it's boiling. At that point, you can turn the heat down to medium (this should still maintain the boil) and count 5 minutes "processing" time without pressure. When time is up, turn off the heat, and carefully remove the lid. Lift out the jars and put them on a clean kitchen towel to dry and cool. You may hear a metal "popping" sound as soon as you pull out the jars or as late as two hours - they may all pop at different times. This indicates that the jar is sealed correctly and can be stored un-refreigerated -the middle will be dipped down like the safety seal on the jars you buy from the store. I always have one or two that once completely cool, have not "popped" yet. In that case I open them, clean the lid and lip of the jar again and "process" again, this time starting with cold water since the contents will have cooled - or just store in the refrigerator and consume first! Yields about six 8oz or 250ml jars. As with any pressure cooker fruit recipe - never fill the pressure cooker more than half-way with fruit (this includes liquid and sugar). Kumquat Marmalade – They are so small is not safe to use the mandolin to slice them. It is quite tedious but totally worth it to slice them using a knife- don’t throw the ends away (the pith is not bitter) set them aside and either use them whole or slice into thing strips. I only used a ratio of 1:1 sugar to fruit. Citron Marmalade – This fruit is all peel and pith – but do not be discouraged the pith is not bitter and actually prized!! So use the whole fruit. Once sliced on the mandolin, cut the slices into 6 (not 4 like in the recipe for lemons) – you don’t want the peels in the marmalade to be unmanageably long. Citrons have very little natural “pulp” and liquid. Add the juice and pulp of 1 lemon for each pound of fruit before pressure cooking. In addition to retaining the seeds, I chopped the end bits and all-pith slices and put the whole works into a cheesecloth package to boil along with the lemon-sugar mixture. Unfortunately, my cheesecloth acreage was limited and the boiling liquid didn’t penetrate or circulate very well, so I don’t think I got much additional pectin out of it. Next time — a big loose package! I also find my result a bit too sweet (1400:724 ratio), so will taste-test 1:1 and 1.25:1 and 1.5:1 next time, too. All the same, it’s yummy! Tried another batch, of half-and-half lemon and lime. Sugar ratio of 1.75:1 produced a nice, tart, slightly bitter result, just the way I like it. This batch was a bit thicker, too, which I attribute to the additional pith. Breville really seem to be the pick of the small appliances these days. They have some really clever people working in their design team. I just picked up their motorised toaster. It really is magical. Tried sealing jars in electric pressure cooker. While i did hear a pop shortly after finish..i notice about 30mins later the bands weren’t tight but top not moving..so appears sealed? Yes, if the lid is sealed on and it doesn’t give when you press in the middle, you’re good. You can also remove the bands from the jar for storage if you like. Yes, your jars are sealed. The bands are not the sealing mechanism, only the lids are. The purpose of the bands is just to hold the lids in place with barely enough pressure to keep the lid in contact with the rim of the jar. During processing, the jar contents expand, and air and steam are forced out under the edge of the gently held lid. After processing, as everything cools, the contents contract and a partial vacuum forms. Normal air pressure outside the jar presses forcefully on the lid and assures the seal. That’s the reason for the “pop”. I look forward to trying this marmalade recipe. My standard recipe is a two day, soak, then cook affair. I just got an Instant Pot so we’ll give it a whirl. I’m “The Marmalady” in my circle of friends. As far as I am aware there is no approved method for canning in the instant pot. however, i believe marmalade can be water bath processed. (which you are essentially doing) but someone might get sick if they aren’t being careful. Just confirming – it’s a 5 minute water bath process and not a 10 minute for the 8oz jars? Thanks!